Steve and Ruth Smith have been playing music together for over 35 years. From their home in the Blue Ridge Mountains of North Carolina, they have performed their Celtic Appalachian music extensively in the U.S. from North Carolina to Hawaii. They have also been cultural music representatives of the Appalachian region, touring abroad in Japan, Korea, the Philippines, Hong Kong, Thailand, Australia, New Zealand, Tonga, and Canada. Ruth plays the hammered and Appalachian mountain dulcimers with Steve supporting on fingerstyle acoustic guitar, clawhammer banjo, and vocals. 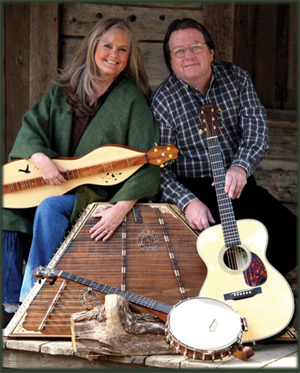 Steve and Ruth are 2009 Instrumental Roots Music nominees in the world's largest independant music awards and are two-time recipients of North Carolina Arts Council grants. A native North Carolinian, Ruth began playing music at a very young age and enjoys the adaptability of the hammered dulcimer to many types of music, from traditional fiddle tunes and Appalachian songs, to Celtic and classical melodies. After playing many different musical instruments through the years, she found the hammered dulcimer to be a "fit" to her personality and a wonderful tool of self-expression. Ruth, who studied music at the University of Illinois, composes music especially for the hammered dulcimer and her compositions have been featured on NPR's All Songs Considered and in Dulcimer Players News magazine. Dirty Linen Folk & World Music Magazine says "Ruth Smith's touch on the hammered dulcimer is absolutely magical with exquisite phrasing." She teaches hammered dulcimer workshops at festivals throughout the country. Ruth is also accomplished in traditional Appalachian fiber arts, including weaving and spinning. Dirty Linen Folk & World Music Magazine says Steve Smith's accompaniment on guitar and clawhammer banjo provides "a traditional . . . rich, true sound" to their Celtic Appalachian music. Steve, an ASCAP award-winning song-writer, worked along with Ruth throughout the 1970s and 1980s in the music industry in Nashville, Los Angeles, and Hawaii. Since 1997 he has also been teaching audio production/recording at Appalachian State University. Steve has a Master's degree in Appalachian Studies from Appalachian State University with a major emphasis in Appalachian music and folklife, and is the recipient of the Cratis Williams Fellowship in Appalachian Studies. In the 1990s, Steve created, produced, wrote and hosted the weekly multi-state syndicated radio program, "The Appalachian Way," about the music and folklife in Appalachia. He also teaches festival workshops on guitar, clawhammer banjo, recording, copyrights & publishing, live sound reinforcement, and performing techniques.